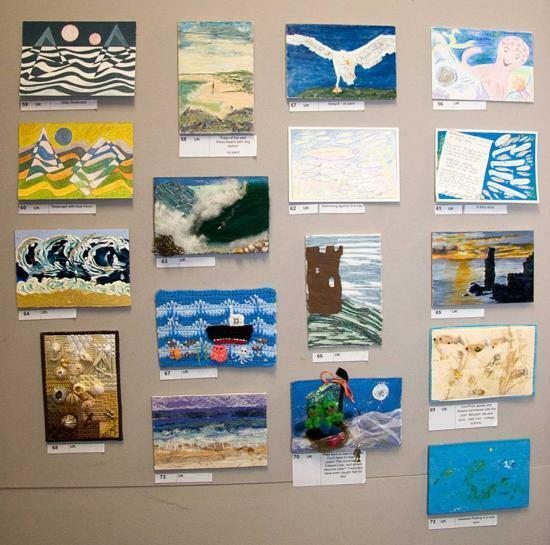 The success of the exhibition, which opened to a capacity audience of well over 100 people on the evening of Wednesday 2nd July at Castletown Heritage Centre, was down to the artistic talents and generosity of locals and others further afield. Businesses near and far also gave generously to support the event. Caithness artists Liz O'Donnell and Joanne B Kaar were the glue holding the project together, inspiring others to get involved and help raise money for two groups both run by volunteers, Brough Bay Association and Castletown Heritage Society. Brough Bay Association chairman, George Douglas introduced Councillor Bill Fernie who officially pronounced the exhibition open. There was quite a buzz that evening, as three musicians, Dave Broughton on fiddle, Joe Kaar on guitar and Joanne B Kaar on wooden flute provided background music. Drinks and nibbles were handed out as people arrived, with the additional excitement of a raffle which was drawn on the night - 1st prize was a voucher for 2 maxi day tours of Orkney thanks to John O'Groats ferries, it was won by Jenny Swanson from Castletown. Over 200 artworks are on display and were greatly admired, some people looking for their own entries, many searched out friends and families creations while others were bidding for work and a chance to acquire an original piece of art. There is something for everyone here, from collages, glass work, and traditional oil painting. With the first bids placed on private view night, their initial expectations have already been exceeded, but they are not giving any clues away, as the final amount raised will be revealed only when all bids have been sent in and the exhibition closes at the end of July. Do visit Castlehill Heritage Centre to see the exhibition, place a few bids for your favourite artworks, and join in the raffle which will be drawn when the exhibition closes, tickets are only £1 each and you could win the top prize thanks to NorthLink ferries, a free return trip Scrabster to Stromness for 4 passengers, a car and Magnus' Lounge access. All funds raised from the auction will be given to Brough Bay Association and Castletown Heritage Society, both of which are run by volunteers.